Harry Maguire has scored a much-deserved first goal for England in today’s World Cup quarter-final clash with Sweden. Football, it seems, may really be coming home as Gareth Southgate’s side lead once again despite a slow start against solid opposition today. 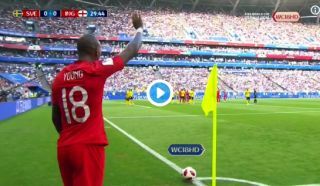 Ashley Young swung in a superb corner on the half-hour mark and Maguire attacked the ball with so much aggression and deadly accuracy to find the back of the net. One of the most popular players in the England squad, Maguire has been a revelation since becoming a regular for the Three Lions and he’s certainly earned today’s strike after threatening on so many occasions at this tournament.